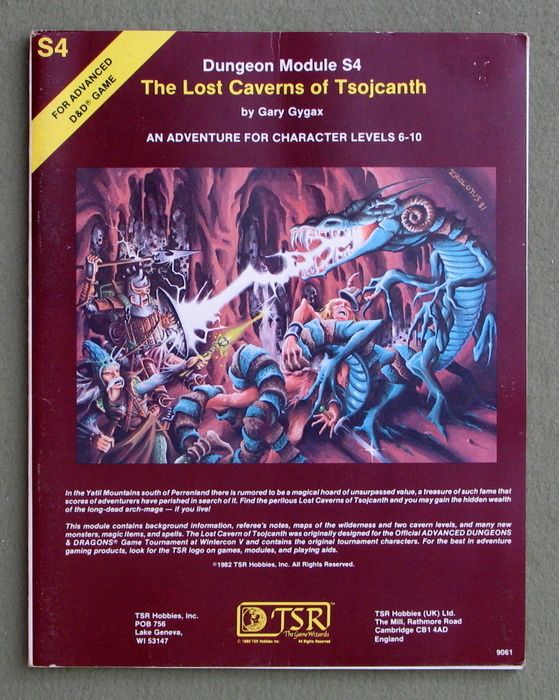 Adventure module S4 The Lost Caverns of Tsojcanth has never been one of my favorites. Much like its semi-sequel, WG4 The Forgotten Temple of Tharizdun, I never ran it back in the day, and I never really understood the appeal, beyond the sneak-peak at the Monster Manual II it contained. However, it’s one of the classics, and I felt it was long overdue for a look-see. Perhaps a deeper dive will improve my appreciation for it, as was the case with WG4. I’m not going to go into the history of the module itself. Others have done so, and I’m not sure I see much merit in exploring that same territory again. But let’s take a look at the “flyover country” of the module. Namely, the Introduction. Nearly a century ago the Arch-mage Iggwilv sent her evil minions to conquer the lands around her abode. So successful was she that the Marches of Perrenland were subjugated for a decade, and great indeed was the loot brought to Iggwilv’s lair in answer to her insatiable demands for treasure. Legend states that the arch-mage gained much of her prowess from discovering the Lost Caverns of Tsojcanth, where in was hidden magic of unsurpassed might. It is certain that lggwilv ruled her domain from these caverns. There she also conducted arcane experiments and rituals, trying to further increase her powers. One might wonder why such a thing might be significant, until one remembers that Iggwilv is the mother of the cambion Iuz. So it would seem that at the same time Iggwilv launched her campaign of conquest, her son was also installed as a ruler hundreds of miles to the northeast. Although it comes from the post-Gygax era, the book WGR5 Iuz the Evil fits in perfectly with the timeline and the description. At the time, the lands north of Whyestil Lake were just a collection of petty nobles, much like the Bandit Kingdoms. In 479, Iuz assumed control of one of the minor fiefdoms and slowly worked his way to control of the entire region, conquering all “in little more than a decade.” Let’s call that 11 years. 479: Iggwilv begins her conquest of the Yatils and Perrenland, Iuz begins his conquest of the lands north of Whyestil Lake. 480: Iggwilv’s conquest is complete, her decade-long rule begins. 490: Iuz conquers the land currently known as Iuz (between the Howling Hills, Whyestil Lake, and the rivers Dulsi and Opicm). We are left to wonder why Iuz and Iggwilv began their respective campaigns, seemingly at the same time. If they were part of a concerted effort on the part of Iggwilv, the placement of Iuz doesn’t make much sense, strategically. Even the westernmost boundary of Iuz is more than 500 miles from Perrenland, and that mostly impassable forest and mountain. If the idea was for Iuz to present a strategic pincer against Perrenland, it would have taken years for such a thing to properly manifest, and even then distance and terrain would have made such a thing difficult at best. That implies that the two efforts weren’t coordinated, but rather that Iuz went off on his own. If Gygax’s Gord the Rogue books are to be believed, Iuz and Iggwilv are not exactly the best of friends, and given how their relationship is painted therein (the examples are too numerous to list, but see especially the novels Artifact of Evil and Sea of Death), it’s entirely possible the two began their conquests at the same time, but not as part of a single scheme. Indeed, they might even have been rivals; the witch-queen and her son, who also happens to be the son of her imprisoned lover, Graz’zt. Still, Iuz the Evil (p. 3) tells us that Iggwilv aided her son, so there has to have been some level of cooperation there, even if it might have been grudging. It’s also worth noting the introduction states definitively “It is certain that lggwilv ruled her domain from these caverns.” That will be significant later; let us mentally mark it. 490: Iggwilv’s realm is destroyed. However, I think we see something even more significant. When we see that Iuz conquers the realm known as Iuz in 490, the same year that his mother falls, that marks the end of his own expansion. For eleven years, Iuz steadily conquered the lands north of Whyestil Lake and then… stopped. What happened? Why would he suddenly stop when his strength was on the rise? The implication is clear – with Iggwilv (and her magical support) gone, Iuz could no longer expand. For fifteen years he stopped, and waited, and consolidated his power, until he was himself imprisoned and his realm fell into anarchy. That must mean Iggwilv’s support was much more significant that we had been led to believe. In fact, it’s not even mentioned directly in the Gygaxian sources, as far as I can see. But the timing makes it clear. Taking another look at the “strategic pincer” idea above, another possibility does present itself. True, such a thing wouldn’t make any sense if Perrenland were the target. But what if there was another target in mind? 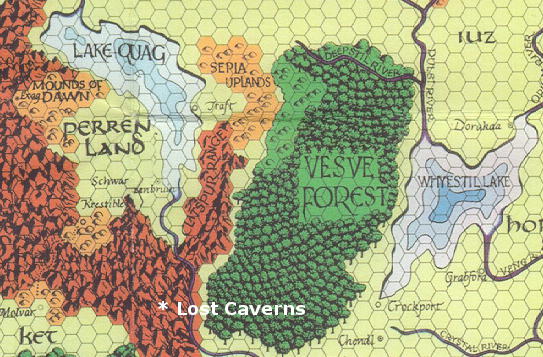 If the true prize were between the caverns of Tsojcanth (hex E5-88 on the original Darlene maps, 6 hexes due south of Schwartzenbruin) and Iuz, then such a thing would make perfect sense. And what lies between them, what is this great prize? The Vesve Forest. I’m not quite sure yet why that would be something Iggwilv might covet, but if the “strategic pincer” idea is true, then that would be it. Of course, it could just be that Iuz was set up in the closest land in a state of semi-anarchy, without any real strategic intention other than conquest for its own sake, or to distract Furyondy. That is absolutely just as possible. These experiments were her downfall, for during one she accidentally freed the demon Graz’zt, whom she had imprisoned and forced into servitude. There was a terrible battle, and although the demon was forced to flee to the Abyss, lggwilv was so stricken from the contest that her powers and strength were forever lost. With the wane of her evil, lggwilv’s realm was sundered. Her former henchmen and slaves stole her treasure and scattered to the four winds in the face of enemy armies. The arch-mage, however, used the last of her power to prepare a hiding place in the caverns for her remaining wealth. Legends say that this included several tomes of great power and the fabled lamp called Daoud’s Wondrous Lanthorn. What else might be hidden no one knows, for no one has yet discovered Iggwilv’s hoard. That lggwilv is long dead and gone cannot be doubted. Until recently, though, the stories of her secret cache of treasure in the Lost Caverns of Tsojcanth were regarded as another grandfathers’ tale to amuse the younglings. Cartloads of tapestries and rugs, statues and rare art objects have been recovered over the years as well as chests of precious metals, sacks of coin, and coffers filled with gems and jewelry. It was believed that all her treasure had been looted, and that no magic or wealth remained. However, recent investigations have indicated that the magical lanthorn did exist and that lggwilv possessed it. Iggwilv’s lair was definitely located somewhere between the gorge of the Velverdyva River and the hills east of the town of Krestible. The realms of luz, Perrenland, and Ket have sent expeditions into the Yatil Mountains seeking the exact location of the caverns; the few that have survived have all failed. Graz’zt is, of course, the ebon-hued demon lord with whom Iggwilv conceived the half-demon Iuz. So his being imprisoned, and then accidentally freed, maps well. I think, however, that it’s notable that Iuz is mentioned as one of the realms that has sent expeditions into the Yatil Mountains in search of Iggwilv’s hoard. As previously mentioned, there’s a lot of distance between Iggwilv’s realm and Iuz. Mounting such an expedition would be an enormous undertaking – far moreso than Perrenland or Ket, which are adjacent to the Yatil mountains. The Flanaess is literally littered with hoards of magical artifacts and powerful magic tomes. That Iuz bent his resources in that direction speaks to the connection he had with his mother. One might even be tempted to speculate that if Zagyg had not taken Iuz out of commission between 505 and 570, he would have long ago found and pillaged his mother’s collection of magical artifacts and turned them to his own use. Perhaps Iuz sent the expedition(s) in search of the caverns of Tsojcanth in order to be able to renew his conquests of the surrounding territories. He was looking for the source of power his mother used to assist him in his rise. I love The Lost Caverns of Tsojcanth for a lot of reasons, one of them being that it’s like the GDQ series in having so much more going on in the background than is apparent at first glance. The thing that always bugged me, though, is that when you look at the Caverns themselves, there’s almost no indication anyone ever used the place as a base. It just looks like a natural cavern complex that various monsters have moved into over the centuries. Where are the kitchens and bedrooms where Iggwilv and her minions would have eaten and slept? Where are Iggwilv’s throne room or the laboratories where she wrote the Demonomicon and kept Grazz’t imprisoned? The only indication of anyone living in the place full-time are the magical doors that keep Iggwilv’s hoard sealed up, and those could have been placed by Iggwilv if she just wanted an especially hard to find place for her hoard. Looking forward to parts 2+, Joe! There is of course the matter of the TOEE. In the Secret History of the Temple section (pg 28-29) Iuz requests an audience with Zuggtmoy. I know the module is confused in places, but given that the Temple fell in 569, a year before Iuz was freed from his imprisonment, when did this audience take place. Presumably it would have to have been before 505…..placing it in the time frame where Iggwilv and Iuz were empire building. Was it in fact intended that there would be a triangulation to attack Veluna /Furyondy? In that case, the position makes more sense from a strategic perspective. Ugh. The timeline of Iuz and the ToEE is really messed up, for exactly the reason you state. It contradicts the timeline of Iuz’s imprisonment. I’ve mentioned the very same thing in my explorations of Temple of Elemental Evil, and haven’t yet found a satisfying answer.